Now that we've examined the hardware specs of the HTC Droid DNA and compared it to that of the competition, it is time to take a look at a bit more basic of a feature - the device's size. Just how big is the new Droid smartphone exactly and how does it compare to other high-end Androids? Well, the answer is visualized below. It is clear that the DNA isn't exactly a surprisingly thin device. At 9.73 millimeters, it is okay, but it is also the thickest among the bunch of smartphones we are comparing it to below, namely the Samsung Galaxy S II, Galaxy S III, and LG Nexus 4. Its weight, however, is more than acceptable as the HTC Droid DNA tips the scale at 138 grams. In comparison, the Nexus 4 is a gram heavier, while the Galaxy S III is a tad lighter at 133 grams. The Galaxy Note II is considerably heavier as it weighs 182 grams. For tons of further information, check out our HTC Droid DNA hands-on. Note II is definitely 'Big Pappa'!! I love that screen but what good is it if there is only 16gig of storage. And that internal 2020mah is not big enough for me. The price is right at $199 vs $299 for the Note. lol yeah and the dna is crying for more power u cant see any difference between 720p and 1080p on such "smal" screens.. but ur battery will tell u in few hours what is 720p and what is 1080p lol NOTE 2 the best! BUURRRRNNNN!!!! LOL!!! your comment just made my day..
umm... how many samsung devices sold over htc???? im pretty sure an ugly phone doesn't sell well. but youre right htc is on the money you can tell by their success youre supposed to decrease in sales and placement right?? You haven't seen the differences between 1080p or 720p in person, so you can't really say s**t on the subject. Full of assumptions based on what other people and critics of the technology are saying. You could lay out 10 x 5" 720p and 10 x 5" 1080p displays. If the dpi is relative on them, a majority of the population would not be able to tell you which is which without guessing. I think people should be more impressed with the 440 dpi screen the DNA is rocking. The screen should look amazing if it is really 440 dpi. The Note II is around 300dpi. That should make a bigger difference than resolution. I wished the Note II and DNA could be mashed together. It would then form the perfect phablet for me. Thanks for playing, next time try not to be such a blatant Samsung fanboy. The ONLY PEOPLE who will be tricked into the Htc DNA is those rejects on Verizon. The Samsung Galaxy Note 2 is the BEST ultimate all purpose/entertainment device ever. No Htc DNA will ever compare on it's best day. I can't help but laugh at all the pretenders in the Android space. If your not rolling with Samsung then very simply your NOT ROLLING AT ALL. haha lmao your like one of those wannabe gangsters, rolling with samsung haha samsung are becoming the apple of the android world, not because they dont change anything, but because of the samsung fanboys appearing everywhere like yourself so tell me why the note 2 is the only phablet to consider? Oh please stop hating you sound like you have a whackberry or iphon . Get with the program I'm pretty sure you're not rolling correctly in the tech game. @chaoticrazor: you ask a great question. Why is the note 2 the only phablet to consider? That question can only be asked after due consideration to other smartphones offering the same functionality have been assessed and for one reason or another been discarded as inferior. So lets look at a wish list of hardware and software features and specs and narrow down the list of perspective devices wihich include - Galaxy Note, Galaxy Note 2, Droid DNA, HTC 1 X5, Optimus Vu, Optimus Vu 2, Sony Yugo and Huawei Ascend Mate. I know that some of these have not been released yet but leaked specs are available for most. Hardware minimum requirements: Quad core processor - min 1.5 GHz Ram - at least 2 GB Screen - min 720p Built-in Wacom digitizer Digital stylus support Internal memory - min 16 GB Expandable external memory - min 32 GB supported Battery - min 2500mAh (removable preferred) Screen size - equal or greater than 5 inches (These are the BASIC requirements - this doesn't include speaker, NFC support and a host of other hardware components) Software minimum requirements: Android Jelly Bean (or Windows 8 mobile) multitasking functionality Mutliple window functionality Digitizer support (Screen and digital stylus support) Upgrade support Quality UI interface Now it appears that I have weighed this heavily in favor of the Galaxy Note series of products but honestly I haven't. The original Galaxy Note pioneered the class of smartphone (the Dell Streak failed experiment not withstanding) and set the standard to aim for. Review the devices I mentioned above and do an honest assessment of their capabilities. Remember what a phablet's function is supposed to be - a dual functioning smartphone and tablet substitute. With the smaller screen how can you access drop down and pull-out menus on a webpage with out a precise digital stylus (only one of a thousand examples that could be offered)? I own a Note 2 and I honestly believe that a 1080p resolution would not significantly improve the quality of the Note 2's 720p non-pentile screen from the distance I view the screen from (10 to 15 inches). I have viewed DVDs that I converted to 1280x720 resolution and have to say they are amazing on the 5.55 inch screen. Text is ultra crisp and colors are amazing so the 1080p screen is a non-factor especially if it comes at the expense of the Wacom digitizer to currently supports only 1280x780. What can you say about the built quality of Samsung products and Note in particular? And the aesthetics of it too? Not exactly cute, or gorgeous looking phone, or even expensive looking... Does that matter at all? continued from previous post - So to summarize:- The Galaxy Note series of smartphones and tablets are the only products that meet all the requirements above and the Galaxy Note 2 excells above the original Note but the Note 10.1 will be comperable once it gets its Jelly Bean update minus the phone capabilities of the Note 2. Picking as personal a device as a smartphone that will be with you for as long as two years should not be done lightly or you will end up regretting your choice. You must evaluate each device and decide what you can live without as opposed to what you think is cool now but will irritate two months down the road. If you really are looking for a phablet, the Note 2 has an exceptional battery, screen, processor, internal/external memory support with 2 GB onboard RAM, beautiful 5.55 inch screen that doesn't hog the (removable) battery, built-in digitizer with digital stylus as well as vital multitasking software enhancements including multiple window and floating window support to name but one example. This is my first Samsung device so my evaluation is based on my experience with the Note 2 over the last week. I can't think of any significant software feature or hardware component that they missed when designing this phone. That's not surprising as they had the original Note as a global test case for the new and improved Note 2. Every manufacturer is currently playing catch up and some are trying to skip ahead with gimicks like 1080p displays while missing the true mark of a digitizer and digital stylus. It's easier to upgrade a screen than to incorporate digitizer hardware and software to where it might be competative with Samsung's offering. By trying to shortcut the R&D process these manufacturers are simply taking 2 steps backwards for noe innovative step forward they make and meanwhile Samsung is busy developing the Note 3 which will probably have a 1080p screen and and even more advanced S-pen. Smart people do such stupid things sometimes. I think we as fans of the Galaxy Note 2 have to agree that the Droid DNA is a nice phone. The build is excellent and the higher screen resolution is innovative - however - with a criminally small non-removable battery and NO micro SD card support and only 16 GB of internal memory, HTC is doing a major disservice to its fan base. I want to give the Droid DNA a chance but short changing potential customers on power and storage is unforgivable. I would stake money on the fact that consumers would have paid $50-$100 extra for a 3000+ mAh battery and a micro SD slot. 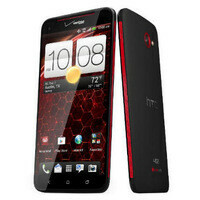 HTC has argued that the Droid DNA is NOT a phablet and I agree. They argue that it doesn't and will never have support for a digital stylus so insist it be considered a smartphone only. I concur. The Droid DNA while an excellent smartphone - with a few serious flaws as mentioned above - is not in the same league as the Note 2. But that's OK. Only the original Note and the Note 10.1 can claim to be close to as functional as the Note 2 in the Android universe. Once smartphone manufacturers start putting ditigizer boards on their phone as standard with digital stylus support we will begin to see parity again but until that happens the Galaxy Note series will reign supreme. Hmmmm.... 'size comparison'?? Sounds like fun.